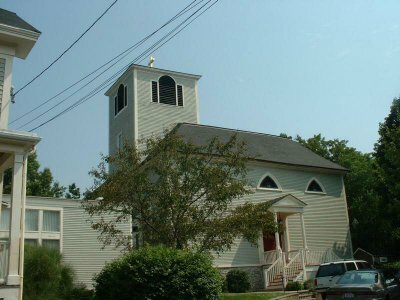 The church: St Michael's, Marblehead, Massachusetts, USA. The building: The building is the second-oldest still-used episcopal church building in the USA. While it has been altered many times (and has plans displayed to demonstrate this), it still has the air of an 18th century CofE place of worship. The pews have doors, which were recently refurbished so they work, and latch, perfectly. The tables of the 10 Commandments, the Creed, and the Lord's Prayer still gleam faintly behind the altar. The bell, cast by Paul Revere, still rings in the belfry. God's in Heaven, all's right with the world. The neighbourhood: Marblehead, Massachusetts is the yachting capital of the world and the birthplace of the American navy. The immediate neighbourhood of the church is one of the oldest parts of town, and boasts many colonial buildings. It was nearly empty--about 30 souls in a building that could seat 200 easily. Perhaps it was the 4th of July holiday that kept 'em away. An usher tucked away in the back greeted me as I entered and handed me the service sheets. It was a pew with a door and very comfy cushions. The only problem was unlatching the pew door: I fumbled for a few moments until I figured out the secret and opened it. It was reverential, but very punctual. A five-minute prelude introduced the service and everyone sat quietly and listened. "Blessed be God, Father, Son, and Holy Spirit." A bespoke service sheet and the 1982 Hymnal. The service sheet was basically taken from the Book of Common Prayer. Organ, and quite well, too. It was a visiting organist, to boot. The church itself is so quaint that I was gazing around more than paying attention to the service at times. A (Victorian, unfortunately) stained-glass window caught my eye: portraying Dorcas giving out clothing to the poor (one of whom looked uncannily like the Jesus in the next window but one), the caption was: "She hath done what she could" referring to the woman with the precious oil for Jesus's feet. The dedication was to a Maria Appleton, and one wonders whether she was the parish clothing club coordinator or a very put-upon lady who was only as good as she ought to be. According to locals, the answer is lost in the mists of 120 years ago. The worship was Anglo-Catholic but not smoky. Instead of tinkly altar bells, the Paul Revere bell in the belfry tolled at the consecration. 7  Fr. Wootten was very matter-of-fact, and simply read the sermon, but the material itself was quite interesting and memorable. Capitalism has been victimising itself and the law has still not caught up  greed is a corrupting practice for everyone, but avarice, and not money, is the root of all evil. There is no place for belief in today's marketplace. He quoted Dostoevsky: "Where there is no God all things are legal." We bless the money in the alms basin each Sunday to signify that all money has a job to do for God. The free enterprise system is a blessing  and it deserves to be guided by moral people who know what it means to be stewards. I think that contemplating the Maria Appleton window and listening to the organ and the song was the most wonderful part of the service. As is my wont, I sang all the hymns and service music clearly and loudly. The older gentleman in the pew directly in front of me turned around after the prayers of the people and just before the peace and said fairly loudly: "It's wonderful to hear someone sing so lustfully in church!" He must have seen my face redden a bit, so he tried to temper the word, but everyone, including the priest, was looking at us. I managed to mutter "thenkyew" in the smallest voice I could muster, as I'm sure he meant lustily. There wasn't any, although I saw a watermelon through the serving hatch. An art exhibit, part of the Marblehead Arts Festival, took up most of the space and perhaps they were afraid of coffee stains on the canvases. They'd also had a lobster roll lunch the previous day, and perhaps that had tuckered them out a bit. 9  I am always drawn to a church that appreciates lusty singing. It's also the closest episcopal church to the ancestral manse and has good liturgy. Yes; the church is going through a hard time but I felt a spirit there that I am sure was not only christian but determined to use that fact to rebuild. I am glad to participate in that spirit through the liturgy. Being accused of lustful singing, of course! The Mystery Worshipper is sponsored by surefish.co.uk, the internet service provider from Christian Aid. By offering email services, special offers with companies such as amazon.co.uk and smile.co.uk, surefish raises more than £300,000 a year for Christian Aid's work around the world. Click here to find out how to become a Mystery Worshipper. And click here if you would like to reproduce this report in your church magazine or website. Top | Other Reports | Become a Mystery Worshipper!